It has been a great week in District 8, with hundreds of community members coming out to vote for projects that they believe in. If you haven’t had a chance to vote yet, there’s still time – check out the list of voting sites and times on our PB site, www.mmviverito.com/pbnyc. 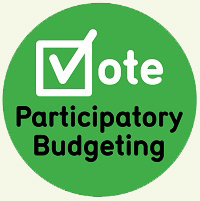 To conclude the weeklong voting process, the Second Annual Participatory Budgeting Celebration, unveiling the winning projects, will be held on Monday, April 8th from 6:30 PM to 8:30 PM at the Johnson Community Center (1833 Lexington Avenue). 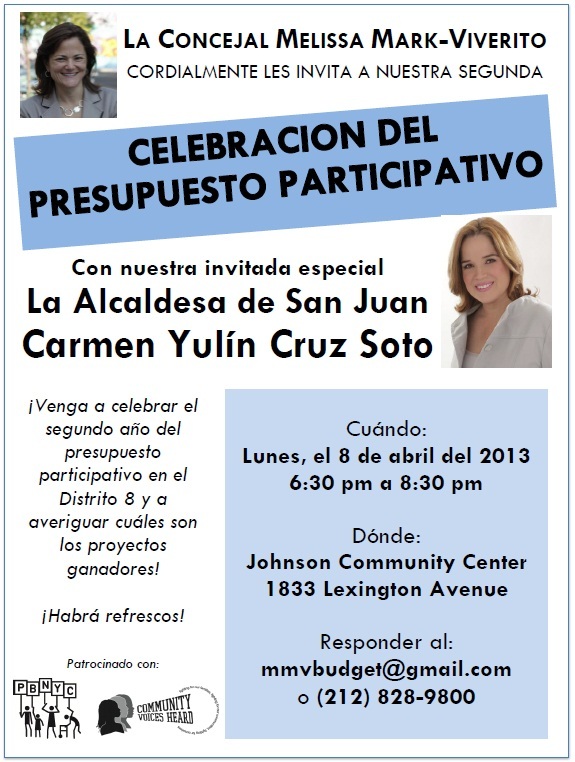 We are very excited to announce that our Second Annual Participatory Budgeting Celebration will feature a very special guest, San Juan’s Mayor Carmen Yulín Cruz Soto. As you may remember, Melissa had the honor to deliver the keynote at her inauguration. Mayor Carmen Yulín has pledged to implement a PB process in San Juan and is coming to see how the process works in our district. This entry was posted in Blog, East Harlem, Events, Manhattan Valley/West Side, Mott Haven, Puerto Rico, Take Action! and tagged community, democracy, East Harlem, El Barrio, Manhattan Valley, Mayor Carmen Yulin Cruz Soto, Mott Haven, Participatory Budgeting, PB, PBNYC, San Juan, voting. Bookmark the permalink.